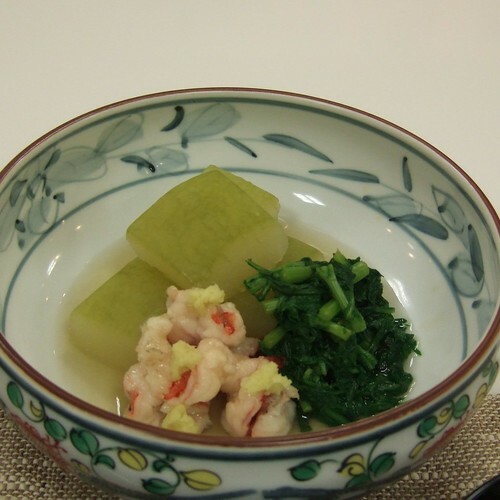 Kaiseki Journal 1: Shoburo-no-kaiseki, to find out about cha-kaiseki and story behind these posts. 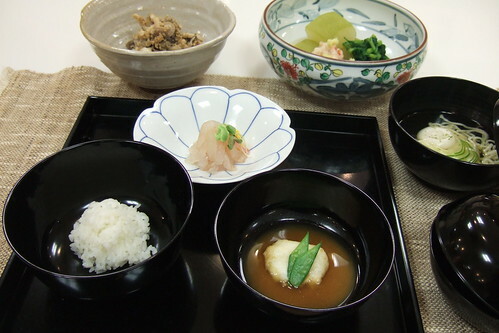 The September kaiseki menu follows the chrysanthemum theme. Karei or flounder is first cut thin, then lightly sprinkled with salt. Edible chrysanthemum petals are used here. Pick petals and blanch very quickly. Cool them in cold water. Squeeze out excessive liquid. To dish up, make a circular cone of thinly sliced flounder. On the side, chrysanthemum and sprouts are added to bring color to the dish. Then, wari-shoyu or soy sauce mixed with lemon juice, broth, and sake is poured over the top. 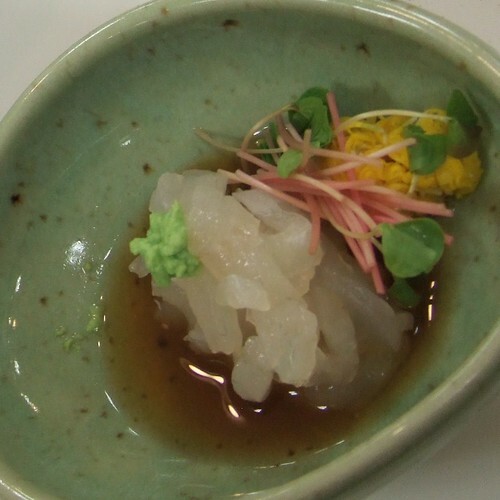 In cha-kaiseki, diners do not dip sashimi in soy sauce in a separate dish. 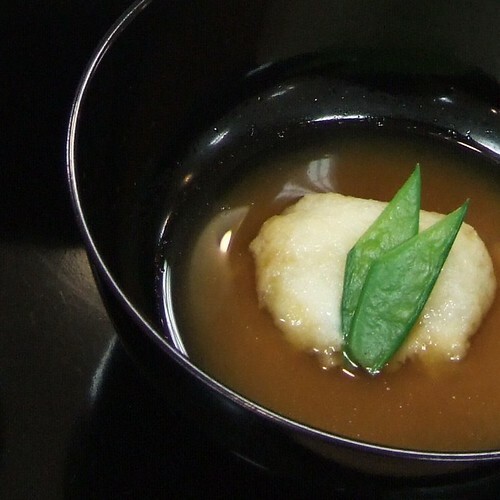 In the sequence of cha-kaiseki I learned, different types of miso are used according to the season. Here, two types of miso, red and white, are used. Yamatoimo or yam is grated, then made into small flat ball to deep fry. Finally, yam cake and snap pea are dished up as soup just before serving. 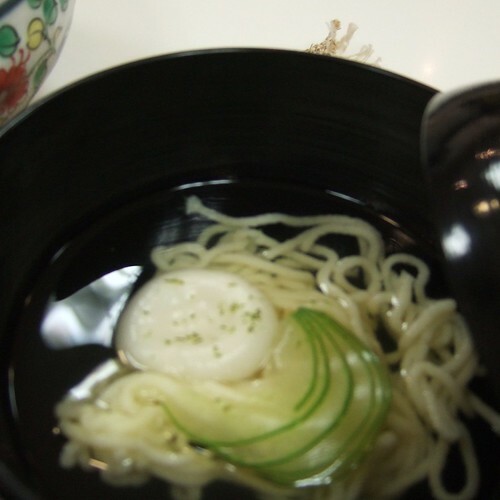 A lot goes into this somen made of fish paste mixed with egg yolk and a tiny bit of starch! There’s a gadget to shoot a single long spaghetti-like stream of fish paste into a big pot with plenty boiling water to make fish noodles instantly. Once you get the hang of it, it is really fun! A small melon is cored, then thinly sliced before cooked in boiling water. Refined rice flour is made into small cake by adding water. Then it is cooked in boiling water. Finally, everything is assembled before serving, and to finish, top it off with a clear broth. Yuzu peel is lightly grated to liven the dish up. Sliced and boiled tougan or winter melon (also sometimes translated as wax gourd). Peeled and devein shrimp, then butterfly before coating with starch, and cooking in broth. Bitter greens, garland chrysanthemum is boiled in hot water. The final touch is beautifully arranging grated ginger around the dish. Shiitake mushrooms are sliced in half, then grilled. 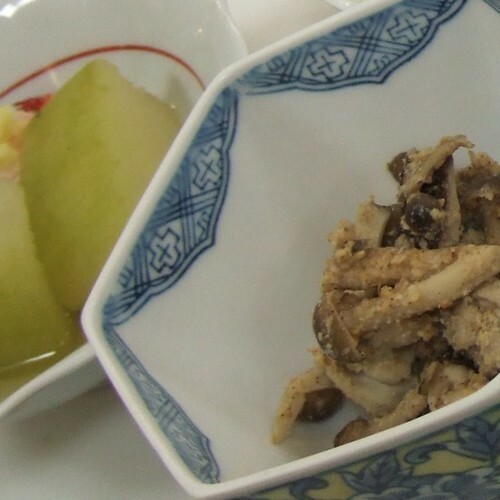 Shimeji and maitake mushrooms are lightly boiled. All mushrooms are mixed in white semame-based sauce made by adding sugar, vinegar, soy sauce, and a bit of broth. Hmmmm. That’s a tough one. I’d love to try Hyotei,Kikunoi, Miyamasou in Kyoto. My sensei is at Ryuunan in Shinjuku and they serve cha-kaiseki. Ukai Chikutei in Takao is more affordable kaiseki style restaurant at 300 years old house I like taking people to. My latest favorite, Igarashi　in Ebisu is not exactly kaiseki restaurant, but they have intricate seasonal multi-course dinner and very friendly chef. I’ll add some more to my list for your next trip to Japan. Hopefully, soon! This is very intersted. I will definitely try. Thanks, Alex! I hope you try fish somen, too. It’s fun and good.